"When Mr. Bilbo Baggins of Bag End announced that he would shortly be celebrating hiseleventy-first birthday with a party of special magnificence, there was much talk andexcitement in Hobbiton." As I write this, the world is currently enjoying the much acclaimed and long-awaitedFellowship Of The Ring motion picture; part one of the entire Lord Of TheRings trilogy. The movie has generated a whole new level of hype around the booksfrom which they come, as well as their author, John Ronald Reuel Tolkien. Tolkien's world of Middle Earth is easily one of the most important events in literary history. The realm of fantasy writing is something of a given nowadays, but itwas primarily ushered in by J.R.R. Tolkien and his vivid, agonizingly detailed imagination,raising the bar for any successive attempts (though it was met quite well by hiscontemporary and friend C.S. Lewis). Writers like Edgar Rice Burroughs and Robert E.Howard expanded the genre, but not to the point to which Tolkien took Middle Earth; aplace with a history so detailed and finely crafted that reading some passages is likedelving into an actual history textbook. Much of the fantasy culture, especially thingslike Dungeons and Dragons games, owe their existence to Tolkien. While he waslargely a private person who did not want to be a celebrity or an icon, the popularity of hisworks since publication made that unavoidable. He thought his books shouldspeak for themselves and that curiosity about the man behind them should not really comeinto it. While Tolkien relented a bit in this wish to stay isolated from his fans, especiallywith his release of the film rights to The Hobbit and The Lord Of TheRings, he still remains something of a mystery. Master Of The Rings presents itself as a documentary about J.R.R. Tolkien,revealing some things about his life and showing the people that his work has touched. Unfortunately, it is neither a biography nor a look into his fans, but rather a mediocrecombination of both into a fairly awkward mixture. While some time in the film's 60minutes is spent on the life of J.R.R Tolkien, it amounts to roughly 20-25 minutes of therunning time; the rest is spent talking to those who are fans of his work. Shortinterview clips with members of the Tolkien Appreciation Society are fine, as are theinterviews with Roger Garland, the classic artist whose work was once consideredhand-in-hand with Tolkien's own words. What, in my opinion, is unacceptable is theinclusion of musician Bob Catley and the masses of Middle-Earth battle "Dagorhir" re-enactors. I say this, because they simply don't fit. The longest portion of the film, spent interviewing live-action role players (or LARPersfor those phrased in RPG speak) is embarassing to say the least. I understand how fanaticrole-players can get, but I feel they don't represent the kind of fan that really needs thiskind of publicity, especially in context with Tolkien's opinions of his own work. While,yes, The Lord Of The Rings is a book filled with combat and conflict, often timeswith battles on immense scales, certainly there is more to the stories. Running around inthe woods with a giant rubber sword, wearing a mishmash of mixed-age clothes (fromsamurai gear to Roman Centurion armor), and claiming to be orcs, elves, or goblins justdoesn't sit right with me. If that's how you want to spend your weekend, by all means do,but I don't see it as the focus of a documentary that's supposed to be "the story behindThe Lord Of The Rings." The same goes with the weighty portion spent with Bob Catley, a rock musician whowrites songs based on Tolkien's stories. Although it's my own opinion the songs are bad,even if you like them, I don't see how it fits in with the story of Tolkien's work. It's nice he's been touched by the work so deeply, but where's the substance? From watching this, you'd think this was representative of everyone who reads the stuff. There are some good portions, such as brief comments from Tolkien's biographerHumphrey Carpenter and the current pastor of the church he attended formost of his adult life. Interestingly, that pastor reveals himself to be a rabid fan of thebooks, putting a curious spin on the issue that Lord Of The Rings is somehow abook rife with pro-evil overtones. We also get to see many of Tolkien's residences, aswell as where he taught English Literature at Oxford for many years. Those in thedocumentary give their thoughts on the (then upcoming) movie, mostly sharing the samesentiment: with today's level of technology, it should come very close to accuratelyconveying the look and feel of the writings. I went into Master Of The Rings knowing very little about John Ronald Reuel Tolkien,and came out of it about the same. This isn't about him or his fans, it's more of afragmented look at some of the pop-culture phenomena that sprang from these books. Ithink many Tolkien fans have spent years locked in that "geek" closet where a lot ofpeople just never wanted to see the attraction to the novels, but with the popularity of themovies, it would seem the detractors are now saying, "Oh, THAT'S what it was allabout!" Shows like this, though, seem to pound home the misconception that allrole-players, fantasy fans, and 'Tolkien-ites' immerse themselves in this level of fanaticism,which isn't the case. Just as there are distinct levels of 'Trekkies	so too are there levels ofappreciation for Middle Earth. Image Transfer Review: The full-screen image is pleasing throughout, with no real problems or complaints. A fewof the darker, interior shots show a bit of background movement, but otherwise, the cleanpicture does a good job of allowing the viewer to briefly step into the lush hills of Englandwhere Tolkien grew up. There is much color and general flair in many of the shots and thevisual aspects are handled well. There is a nice, high-resolution sheen to the program and,though I don't think it was filmed in high-definitition, it comes close to that kind of thing. Audio Transfer Review: The stereo audio is clear and audible, but nothing special. It's mostly dialogue frominterviews with various people, and they all sound perfectly fine. There's not muchactivity to speak of, although there is a rather constant musical score in the background. Extras Review: The disc is about as bare-bones as it gets, with only one menu featuring a "play movie"option. Though there are chapter stops (which will thankfully allow you to skip theweaker portions), there is no menu access to them. The presentation is mediocre at best,with the front cover making a disastrous error in putting a picture of a ring (I assume to bethe One Ring) with Greek lettering around it instead of the language of Mordor. At thevery least, I would have expected a J.R.R. and Christopher Tolkien bibliography. If you're looking for deeper information about Tolkien, I would suggestreading his biography by Humphrey Carpenter. If you're totally new to the whole world ofMiddle Earth thanks to the movies and new exposure to the book (I envy you), why notuse the internet to talk to fans of all types? 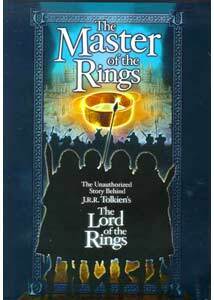 Master Of The Rings is worth aglance for the veteran fan, but I think it paints an awkward, badly condensed picture. At the same time, everyone owes it to themselves to see the new feature film, which is a staggeringvision of the book and a superb movie experience.